Launched in 2007, Dropbox is most well known for being a file-storage and file-sharing web service but, in their words, they are officially a “technology company that builds simple, powerful products for people and businesses.” Most notably, well, the file-storage and file-sharing product that has made it the default web service for such needs, trumping Hightail along the way. Another recent, notable product is Dropbox Paper, a collaborative document editor. Now, Dropbox wants you to think of it as not “only a place to store your files” but a “living workspace where people and ideas come together” — we can keep using it as a place to store files, right? — and yesterday, introduced a new identity designed by New York, NY- and San Francisco, CA-based COLLINS in collaboration with Dropbox’s in-house team, Dropbox Brand Studio; as well as Instrument, XXIX, Sharp Type, and Animade. Our old logo was a blue box that implied, “Dropbox is a great place to store stuff.” The new one is cleaner and simpler. And we’ve evolved it from a literal box, to a collection of surfaces to show that Dropbox is an open platform, and a place for creation. 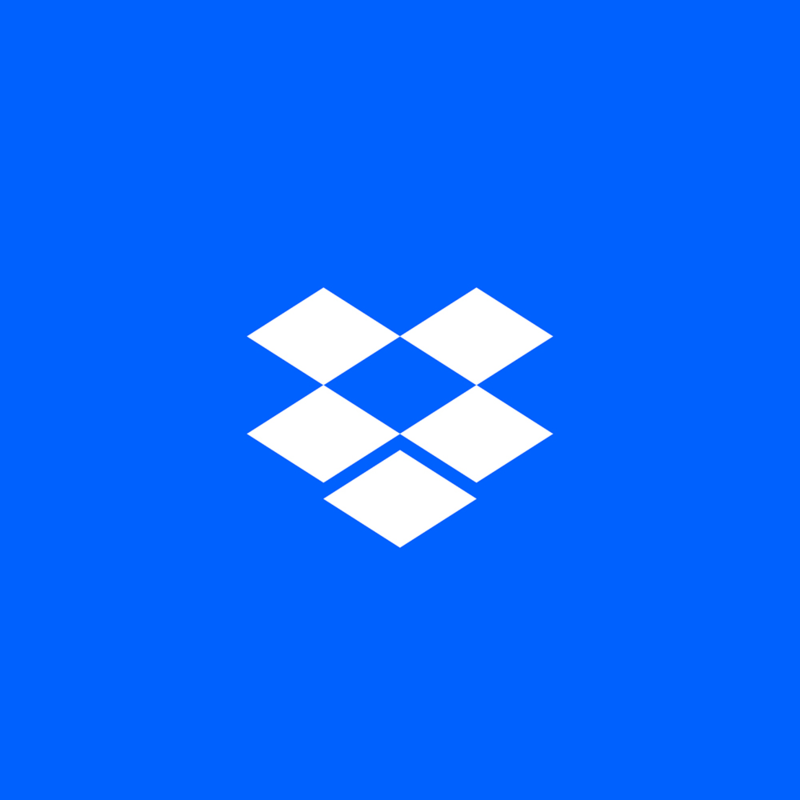 Back in 2015, Dropbox made a feeble attempt at a redesign with a somewhat unnecessary wordmark change that made the logo no much better or worse than it already was (or wasn’t). 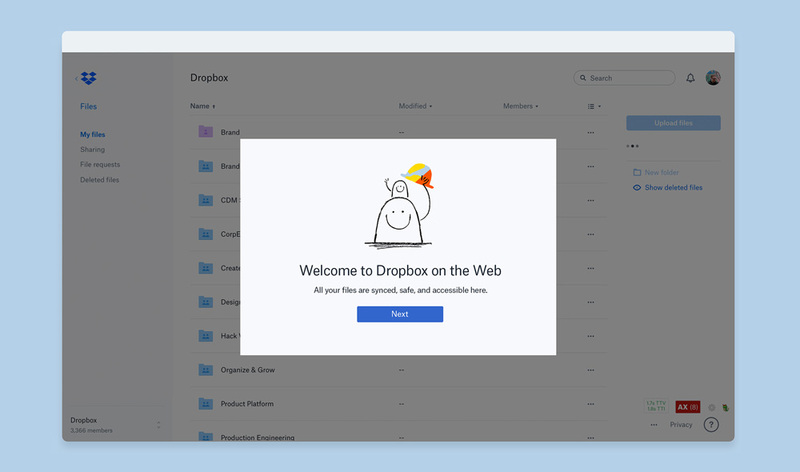 In the company’s short, 10-year history this is the first major change — major being relative as the change is not evidently noticeable to the majority of readers, at least not when logging in to the Dropbox dashboard. The biggest change is that the box icon stops being a literal depiction of a box with floppy flaps and instead it is now a less literal box — because it has always been and will always be a “box” — with uncomfortably long flaps on all sides that would be impossible to close. That assessment, of course, means I am being overly literal and seeing the icon as a diagram of a box instead of seeing it as a quick representative of the company. Unfortunately, when the name contains box and the icon looks like a box, I, and perhaps others, expect a more box-like, box. Trying to shift its meaning to “a collection of surfaces” is conceptually valiant and may look interesting in animation but it’s still a box at the end of the day and the hard, isometric angles of the new icon make it look stiff and slightly disproportionate. The wordmark is an improvement simply because Sharp Grotesk is an infinitely superior typeface than whatever the old one was and shifting the color to black is the equivalent of changing clothes from wearing jeans paired with a denim shirt to pairing jeans with a black t-shirt, which is much more flattering and helps define that there are two parts to the whole. With 259 fonts, our new typeface Sharp Grotesk gives us lots of versatility, allowing us to “speak” in a variety of tones. Most identities rely on a single style (and multiple weights) of a type family. Here, they are using all 21 widths in 7 weights of the type family, which is kind of cool in a gluttonous kind of way… like a kid eating all the candy in the store. We’ll see how this strategy plays out because there is a sharp difference in aesthetics and conveyed feelings between the condensed and extended styles of the typeface that can both communicate different things and feel like completely different companies. Worst case scenario, it will be a fantastic type specimen of Sharp Grotesk once it’s all said and done. 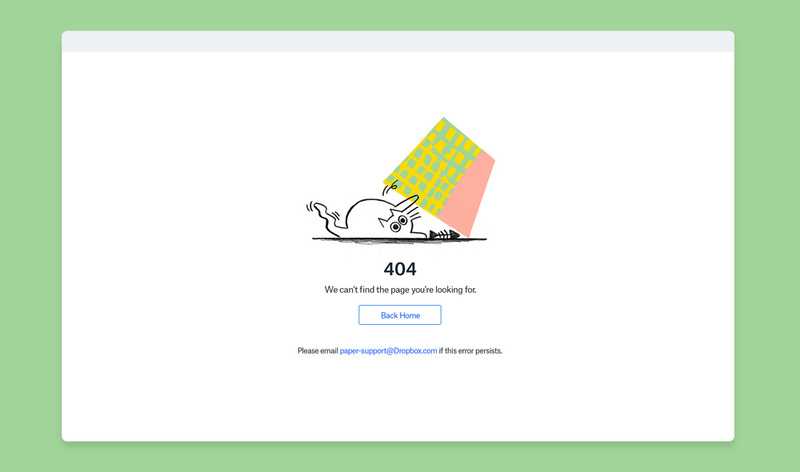 Illustrations for welcome page, archived files, folders, and 404 error page. 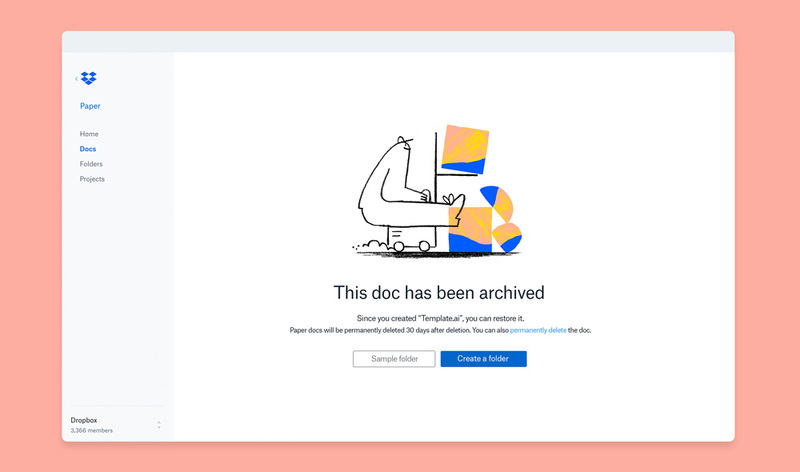 The illustrations are pretty cool and I feel like those are a great evolution of the original aesthetics of Dropbox but done in a more deliberate, memorable way. The combination of graphite scribble and abstract, colorful textures lends itself to some great combinations. But, just as always, the illustrations feel oddly disconnected from the user interface. 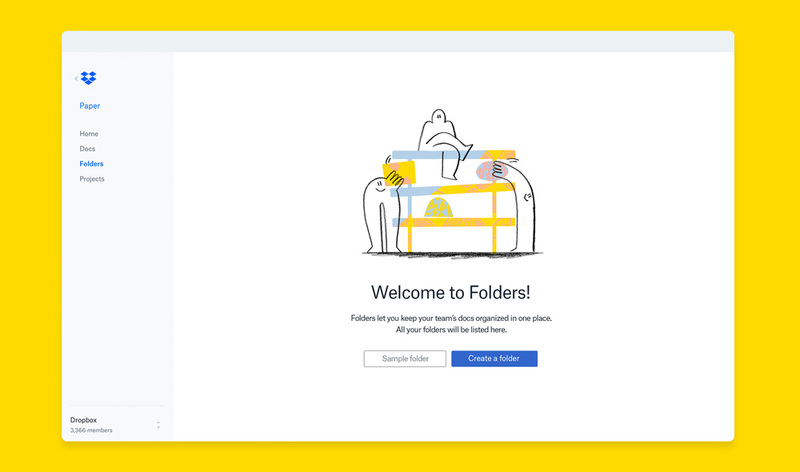 I always felt like the Dropbox illustrations were in conflict with the rest of the interface and were just dropped in into an assigned space, which is still the case and feels less than integrated. Collaboration is an important part of the creative process. When it’s going well, everyone’s ideas build off one another in a “yes-and” scenario. Our co-creation collages are a visual metaphor for this optimistic view of creating work together. Things get a little odd with this idea of “co-creation” and the introduction of exquisite corpse-like collages that try to convey the idea of sharing and collaboration by combining two images that connect visually through whatever they are depicting but clashing in style and medium. They are sort of interesting but, at least for now, not Dropbox-y at all. 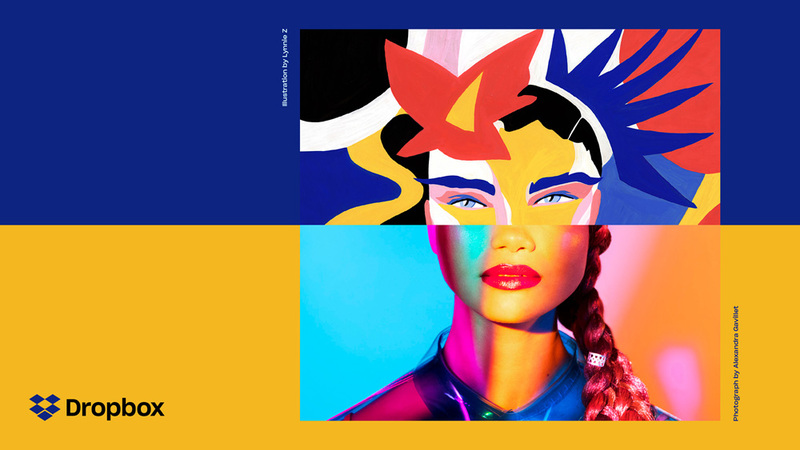 My mind keeps wandering to WeTransfer, which has always had very bombastic illustrations in their background. Also, these almost feel like billboards for a museum exhibit instead of brand expressions of a technology company. Our new system lets us pick the right amount of expressiveness for the situation. 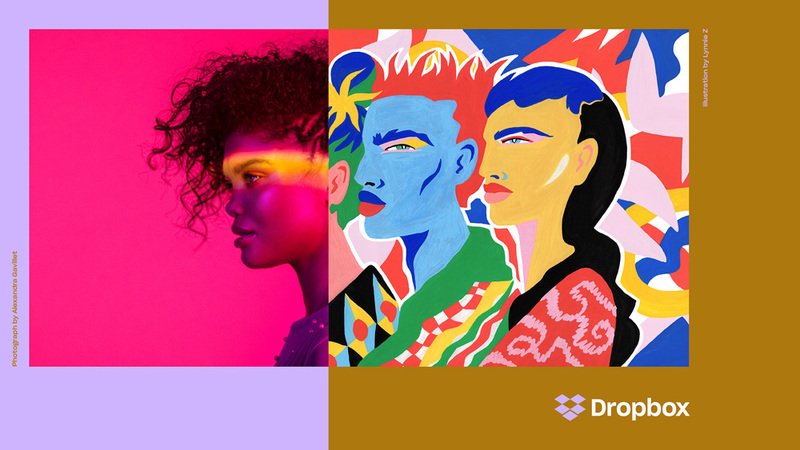 Color can go from a standard Dropbox blue to “whoa.” Same for type, photography, and illustration. In a marketing campaign, we can dial things up to provoke and inspire creative energy. But in our product, where people need to concentrate on their work, we can dial it down. While there is something exciting about all the individual identity elements, concepts, and executions of each, perhaps there is too much to each of them and when they come together, it’s hard to tell what we are supposed to take away from it. 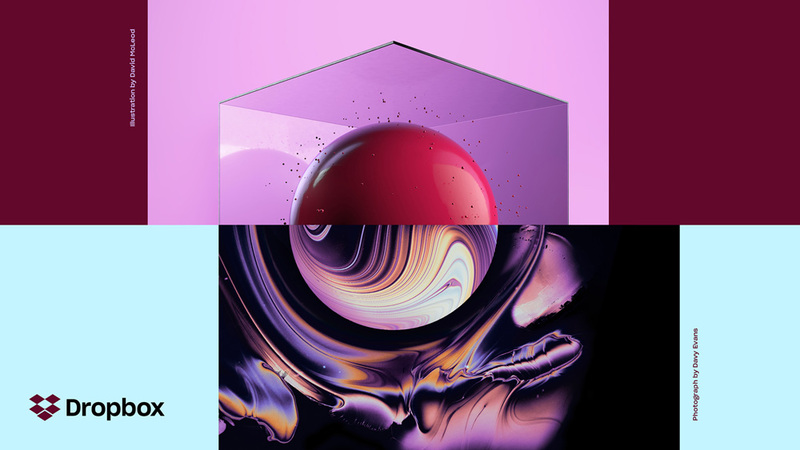 Right now, you can see the new identity on this Dropbox area of their website and it all feels kind of random, from the color of the logo to the background colors to the co-creation image. I feel like I should like this more than I do and perhaps it’s my hesitation to accept Dropbox not just as file-storage but as a tool that enables and empowers me to be more creative… because it is not. It would be like saying that my portable 1 terabyte hard drive allows me to come up with ideas. It does not. The same way Dropbox does not. Which is fine as I am not expecting or looking for a product like Dropbox to inspire me. As a disclaimer I should state that I am not a power Dropbox user… I only have the free account with 2GB and I don’t collaborate with anyone on it, so maybe I’m not the target audience (or maybe I totally am the target audience, on the cusp of being a power user). I see it, and use it, as a platform for storing and sharing files and as much as I like things being thoroughly thought out and technically well executed (as is the case here) Dropbox has perhaps gone a little to the extreme in trying to instill itself as a creative brand a la Adobe in our workflow, which is a commendable effort but I feel like this may be too much creative and visual horsepower for what Dropbox ultimately is, “a great place to store stuff”. Launched in 2007, Dropbox is most well known for being a file-storage and file-sharing web service but, in their words, they are officially a \"technology company that builds simple, powerful products for people and businesses.\" Most notably, well, the file-storage and file-sharing product that has made it the default web service for such needs, trumping Hightail along the way. Another recent, notable product is Dropbox Paper, a collaborative document editor. Now, Dropbox wants you to think of it as not \"only a place to store your files\" but a \"living workspace where people and ideas come together\" -- we can keep using it as a place to store files, right? -- and yesterday, introduced a new identity designed by New York, NY- and San Francisco, CA-based COLLINS in collaboration with Dropbox's in-house team, Dropbox Brand Studio; as well as Instrument, XXIX, Sharp Type, and Animade.